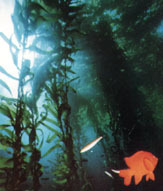 Kelp is the basis of a healthy marine ecosystem (similar to the rain forests). Loss of kelp beds can lead to complete ecosystem collapse. It is the fastest growing plant in the world (2-3 ft a day), the highest oxygenator (repairs ozone, fixes carbon build up in the atmosphere and prevents (or at least slows down) greenhouse effects. Its greatest tribute is that it keeps the oceans clean and the line ups glassy. Over the past decade there has been a drastic decline in kelp forests. This decline resulted from natural phenomena helped by human intervention; kelp is being harvested throughout the world for commercial use and in many areas it is being over harvested. As a result of over harvesting, the ecosystem has been thrown out of balance. Also, the dominant bottom creature in the water off the coast of Baja California is a purple sea urchin that depends on and devours the kelp for its survival. A combination of these factors has caused increased stress on the ecology of the natural kelp forests along the Baja California coast. Due to this damage, a kelp reforestation project for ecosystem reforestation has begun as a Ph.D. thesis at the Universidad Autonoma de Baja California, Instituto de Investigaciones Oceanologicas in Ensenada, Baja California, Mexico, under the guidance of Dr. Jose Zertuche, Professor of Oceanography. We are in the age of global warming. Oxygen and ozone are being depleted in our atmosphere, carbon emissions are on the rise, fossil fuels are taking their tall on the environment as energy sources due to their environmental effects (because they are dead energy sources), biodiversity is endangered, terrestrial biotopes are being destroyed due to heavy agricultural pressure, and biomass is fading fast. It is our responsibility, for our children and their children to take some form of action today. If we don't, who will?